The beautiful scenery of the shimmering blue waters and the snow-capped mountains surrounding it, make Lake Como the top romantic destination. Lake Como has been popular as a tourist destination since the Roman Empire, while today, the luxury villas host the most famous world celebrities. The Como town is famous for its historic centre where you can admire the Renessainse and Gothic architecture. You can take the funicular to climb the hill above the town and enjoy the spectacular view. Bellagio is another town on Lake Como which is worth visiting it. You can take a walk at the promenades by the lake and visit the two public open gardens Villa Serbelloni and Villa Melzi. 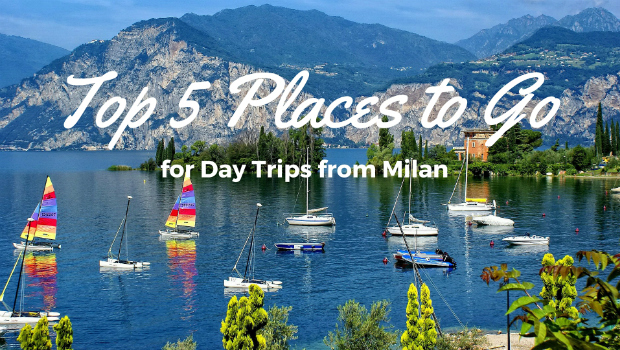 Located in the north of Milan, Lake Como is easily accessible from Milan and Malpensa airport. There are direct train links from Milan and the journey takes around 40 minutes. You can also book private Milan taxi for your one-day trip to Como. Lake Maggiore is often referred to as the most scenic of the Italian lakes. The long, narrow lake was formed from a glacier and the glittering water is overshadowed by the Alps on the north side. Among the picturesque villages and towns residing on the lake’s shore, Stresa is the most popular resort. It’s located on the western shore just across the jewels of Lake Maggiore – the Borromean Islands. You can take a boat ride to the Borromean Islands and admire the beautiful gardens. Villa Pallavicino and Villa Taranto are also famous for its beautiful gardens while climbing the Mount Mottarone is a must as you will enjoy a superb panoramic view of the lake. Reaching Stresa by train is fairly easy since there are regular trains running almost every hour from the main train stations in Milan. Travelling by car is another option and you should take the A8 motorway and then A28 to Carpugnino exit. You can also book roundtrip with private Milan taxis online. Situated on the north bank of the river Po, Cremona has been known as a wealthy city-state over the centuries. The city is famous for its long tradition of violin making which started in the 16th century and continues today in the specialized artisan shops. Cremona is a small, compact city where you can have a peaceful day exploring the city. Almost all historic sites are located on the main square Piazza del Comune, so you can wander around the city on foot. Torrazo, the tallest brick tower in Italy, is the symbol of Cremona. We recommend climbing the stairs to the top of the tower, where you can enjoy the most amazing view of the city. Cremona is around 100 km from Milan and can be reached directly by train in one hour. If you’re travelling by car, you can take the A21 autostrada. Also, private Milan taxis are available and can take you directly from your accommodation to the city. Shopping in Milan can be an overwhelming experience as there is an enormous offer of designer label stores. However, the world capital of fashion is also one of the most expensive cities for shopping, so you’d better prepare to spend a small fortune. For savvy shoppers, there’s good news: one of the biggest outlet villages in Europe is just 50 minutes away from Milan. Serravalle Outlet has 180 stores featuring high-end designer labels like Prada, Gucci, and Versace, just to name a few. Their discounts range from 30% to 70% all year round. Apart from the shopping experience, this outlet village offers a wide range of food corners and cafes where you can take a break during the long shopping day. There are several shuttle service providers which organize transport from Milan to Serravalle. If you’re travelling by car, take the A7 autostrada and exit at Serravalle Scrivia. Another option is to book private Milan taxis and the driver will take you there directly from your hotel. Often overlooked by tourists, Bergamo is one of those cities with a double identity where the old meets the new. The Upper Town features a wealth of Renaissance and Baroque architecture. It consists of a network of small cobbled streets surrounded by the 5 km long Venetian walls. At the heart of the old town is Piazza Vecchia where you should visit the 12th-century Palazzo della Ragione. At Piazza Duomo, you will find the most impressive historic sites including the magnificent Santa Maria Maggiore Cathedral. The Lower Town reflects the urban living so it’s perfect to mix with the locals and feel the lively lifestyle. Bergamo is well connected to Milan by public transport, so you can take a train or bus to get there. If you’re arriving at Bergamo airport, don’t miss the chance to spend a day in the city. Private Milan taxis can take you directly to the city and you can book the service online.